Occurrence: Ground almonds, almond paste, chopped nuts in foods and as garnishes. More information..
Almond (Amygdalus communis) is considered as a tree nut although almond belongs to the family of Rosaceae that also includes apple, pear, peach, cherry, plum, nectarine, apricot, and strawberry. Many processed foods may contain almond for example sweets, snacks, baked goods, ice cream, chewing gum, drinks (almond milk), curry. Severity of almond-induced allergic reactions ranges from slight oral allergy syndrome (itching at the mouth and/or tongue soon after chewing and ingesting the fruit) to severe and even potentially fatal systemic reactions (anaphylactic shock; hives and swelling of the throat, asthma). Severity of allergic reactions depends on which protein(s) in the almond that the patient has become allergic to. In these patients almond allergy is the consequence of cross-reactivity (similarity) between pollen allergens and similar proteins in vegetable foods. As such proteins are rapidly destroyed in the stomach this kind of food allergy is generally mild: in most cases oral allergy syndrome is the only allergic symptom. Moreover, these patients tolerate heat-processed almonds because allergens are heat-labile. Allergenic proteins responsible for this type of allergy are heat-stable and resistant to digestion in the stomach. As a consequence, patients reacting to these protein may experience severe allergic reactions. It is very important to be aware that severe reactions may occur on the first exposure to a nut in patients allergic to a different nut. Unfortunately, the cross-reactivity among tree nuts are very variable both in real life and when measured in blood samples. Thus, it is extremely important that patients with a history of severe allergic reactions to a tree nut avoid the ingestion of other nuts until the absence of reaction to almonds has been unequivocally demonstrated by properly performed diagnosis. Cross-reactivity between tree nuts and peanut is frequently observed on skin tests or in blood samples due to the presence of similar proteins, but actual clinical cross-reactivity is rare. These patients react primarily to a heat-stable protein (LTP) present mainly in Rosaceae but also in most other plant-derived foods. LTP is a widely cross-reacting allergen. Most LTP-allergic subjects have a history of peach allergy (OAS and/or more severe reactions), and about 25% report reactions eating almonds. Allergy to other tree nuts is possible in these patients. LTP is heat-stable and resistant to digestion in the stomach; as a consequence allergic patients may potentially experience severe allergic reactions. Some cases of almond allergy have been reported in patients allergic to natural rubber latex. However such association does not seem typical nor frequent. Tree nuts are considered as one of the most frequent causes of food allergy, but almond allergy seems rather unusual. No good data for occurrence of almond allergy are available. In the United States and in the United Kingdom the frequency of tree nut allergy as a whole is estimated to range between 0.2% and 0.5% both in children and in adults. Tree nuts allergies appear early in childhood, but in Mediterranean countries sensitization to heat-resistant proteins may appear in adults. It is presently unknown whether allergic patients may become tolerant after some years of avoidance. Skin tests with fresh food are generally considered the best in-vivo method to detect walnut allergy, although commercial extracts may prove equally sensitive in patients sensitized to stable allergens. In vitro tests (RAST) are generally also sensitive. Due to the severity of allergic reactions induced by tree nuts oral challenge tests are rarely performed. Almond may be present as a “hidden allergen” in commercial food preparations; a case of almond-induced anaphylaxis due to the ingestion of curry is described. Due to possible cross-reactivity, almond-allergic patients should avoid other tree nuts, such as hazelnut and Brazil nuts, unless their good tolerance has been clearly proven by reliable tests. Other Information: Nuts i.e. Almond, Hazelnut, Walnut, Cashew, Pecan nut, Brazil nut, Pistachio nut, Macadamia nut and Queensland nut and products thereof are listed in annex IIIa of the EU directive on labelling of foods. Bargman et al. (1992)  describe the following symptoms in 8 patients: 3/8 angioedema, 4/8 hives, 2/8 nausea, 5/8 swelling, itching 5/8, 6/8 shortness of breath or difficulty breathing and swallowing and 1/8 anaphylaxis. Roux et al. (1999)  describe 14 patients with life threatening symptoms and 11 with oral hives, itching or mild angioedema. Pasini et al. (2000)  describe 2 patients with life-threatening laryngeal edema. Poltronieri et al. (2002)  describe 4 patients with anaphylaxis and 1 with oral allergy syndrome. Protocol: (controls, definition of positive etc)Clark and Ewan (2003)  used a positive (histamine 10 mg/mL) and negative control (saline). SPT wheal diameters were listed as <3 mm, 3-7 mm and >8 mm. Pasini et al. (2000)  found positive SPT for all 5 atopic patients although only 2 had clinical symptoms with almond. Poltronieri et al. (2002)  report the 5 patients had positive SPT to almond. Clark and Ewan (2003)  found that only 3% of 210 patients who tolerated almond had SPT ≥8 mm. However, there was only a slight correlation between wheal diameter and the severity of the symptoms for the almond allergic patients. CAP (Pasini et al. 2000 ). RAST (Bargman et al. (1992) ). Poltronieri et al. (2002)  used Sera from 5 SPT and challenge positive patients and from 1 other with a high RAST who was not tested further. Sathe et al. (2001)  used sera from 5 patients. Pasini et al. (2000)  used sera from 5 atopic patients. Bargman et al. (1992)  report RAST against almond for 7/8 sera. Ratios were 2.1-59.8 times controls. Pasini et al. (2000)  found that 3 patients were CAP positive but asymptomatic while 2 were CAP negative and suffered allergy. Bargman et al. (1992)  used 10% acrylamide 1D gels for separation. Samples were reduced with beta-mercaptoethanol and heated for 5 minutes at 100 degrees C.
Poltronieri et al. (2002)  used 10-12% acrylamide (or 16% to resolve low molecular mass proteins) 1D gels for separation. Sathe et al. (2001)  used 13% acrylamide 1D gels for separation. Samples were reduced with beta-mercaptoethanol and heated. Pasini et al. (2000)  found that the 2 allergic patients reacted to a 37 kDa protein while the tolerant patients reacted to 50 and 62 kDa glycosylated proteins. Bargman et al. (1992)  electrophoretically transferred proteins onto nitrocellulose membranes. These were cut into strips and incubated with individual sera (diluted 1:10). Almond proteins bound by serum IgE were detected using rabbit 125I-anti-human IgE. Poltronieri et al. (2002)  transferred proteins onto nitrocellulose membranes and detected almond proteins bound by serum IgE by chemiluminescence. Sathe et al. (2001)  transferred proteins onto nitrocellulose membranes which were incubated with pooled sera from five patients (diluted 1:5). Almond proteins bound by serum IgE were detected using equine polyclonal 125I-anti-human IgE (Sanofi Diagnostics Pasteur, Chaska, MN). Pasini et al. (2000)  transferred proteins onto nitrocellulose membranes by semidry electroblotting. Almond proteins bound by serum IgE were detected by chemiluminescence. Bargman et al. (1992)  report found that 7/8 patients showed diverse IgE specificity and one (RAST ratio 2.1) did not bind the extract. Binding to a 45-50 kDa protein or group of proteins was frequent and binding to 70 kDa fell after blanching. Roux et al. (1999)  report binding to 66, 55, 50, 39-44, 37, 28, 17 and 10 kDa with different patterns for severe and mild symptoms. 12/14 subjects with life-threatening reactions to almonds showed IgE binding to almond extract and 11/14 to almond major protein (AMP). Sera from 6/11 patients with milder symptoms gave IgE binding to the 66 or 50 kDa allergens. 2/11 did not show IgE binding. Poltronieri et al. (2002)  found that the 6 sera bound proteins from 12 to 66 kDa. Major bands were at 12 and 45 kDa. Sathe et al. (2001)  found that the combined sera bound to proteins in the 39-66 kDa range and to a protein at about 16 kDa. Symptoms:4 patients gave symptoms described as an anaphylactic reaction and 1 showed oral allergy syndrome (Poltronieri et al. 2002 ). It is not clear if the "anaphylactic reaction" was severe as suggested by Johansson et al. (2001) . Although almond is taxonomically close to cherry, polysensisitzation has been reported with tree nuts and with peanut. This is probably because the almond nut is eaten and expresses seed storage proteins. However, Clark and Ewan (2003)  found in a study of 1000 peanut and tree nut allergic patients that 55% of patients allergic to another nut could tolerate almond. Only 3% (34 patients) reacted most strongly to almond. Teuber et al. (1997)  report that almond oils varied widely in their allergen content depending on their processing. Guillet and Guillet (2000)  report that a five month old child with atopic dermatitis developed contact dermatitis to almond from the oil (no almond had been ingested). Many studies report allergy to "tree nuts". Allergy to almond was the third most common of the tree nuts reported by Sicherer et al. (2001)  with 15% of the 1667 self-reported nut allergic registrants reporting almond allergy. In a later self-reported survey, Sicherer et al. (2003)  report that almond is the third most common tree nut to cause allergy in the USA after walnut and cashew with 32/82 responders reporting allergy. Sicherer et al. (1998)  report 13/54 nut allergic patients as almond allergic. However, the symptoms, described as 89% involved the skin (urticaria, angioedema), 52% the respiratory tract (wheezing, throat tightness, repetitive coughing, dyspnea), and 32% the gastrointestinal tract (vomiting, diarrhea) were not associated with specific nuts. Similarly, Ewan (1996)  report 14 almond allergic patients and symptoms for 62 peanut and nut allergics. Clark and Ewan (2003)  report 34/1000 peanut or nut allergic patients showed their strongest reaction to almond. Considering only patients with a clear history of allergy or tolerance to almond, 210 patients (55%), who were allergic to peanut or another nut, tolerated almond. Roux KH, Teuber SS, Sathe SK. Clinical study of peanut and nut allergy in 62 consecutive patients: new features and associations. Bargman TJ, Rupnow JH, Taylor SL. Roux, K. H.; Sathe, S. K.; Peterson, W. R.; Teuber, S. S.
The major seed storage protein of almond (Almond Major Protein) is an allergen. Pasini G, Simonato B, Giannattasio M, Gemignani C, Curioni A.
Teuber SS, Brown RL, Haapanen LA. Allergenicity of gourmet nut oils processed by different methods. Sathe SK, Teuber SS, Gradziel TM, Roux KH. Electrophoretic and immunological analyses of almond (Prunusdulcis l.) genotypes and hybrids. Roux KH, Teuber SS, Robotham JM, Sathe SK. Detection and stability of the major almond allergen in foods. Poltronieri P, Cappello MS, Dohmae N, Conti A, Fortunato D, Pastorello EA, Ortolani C, Zacheo G.
Identification and characterisation of the IgE-binding proteins 2S albumin and conglutin gamma in almond (Prunus dulcis) seeds. Johansson SG, Hourihane JO, Bousquet J, Bruijnzeel-Koomen C, Dreborg S, Haahtela T, Kowalski ML, Mygind N, Ring J, van Cauwenberge P, van Hage-Hamsten M, Wuthrich B; EAACI (the European Academy of Allergology and Cinical Immunology) nomenclature task force. A revised nomenclature for allergy. An EAACI position statement from the EAACI nomenclature task force. Sicherer SH, Furlong TJ, Munoz-Furlong A, Burks AW, Sampson HA. A voluntary registry for peanut and tree nut allergy: characteristics of the first 5149 registrants. Sicherer SH, Munoz-Furlong A, Sampson HA. Prevalence of peanut and tree nut allergy in the United States determined by means of a random digit dial telephone survey: a 5-year follow-up study. Sicherer SH, Burkes AW, Sampson HA. Process, chemical, enzymatic:Not known but the disulphide linked alpha-helical structures of this protein family is likely to be very stable. Allergen properties & biological function:The 2S albumins are storage protein and some act as enzyme inhibitors. Allergen purification:Almond extract was prepared by defatting with diethyl ether and washing with acetone at -20 degrees C. This was extracted with 10 mM potassium phosphate buffer pH 7.4 with 150 mM NaCl, 0.5 mM phenylmethylsulphonylfluoride and 2 mM beta-mercaptoehanol. After homogenisation and centrifugation, the supernatant was adjusted to pH5 and centrifuged. The supernatant was adjusted to pH 7.0 and solid ammonium suphate added to 40% saturation. The precipitate was centrifuged and resuspended in 25 mM Tris-HCl, pH 7.5, desalted on a Sephadex G-100 column and loaded on a Mono-Q ion-exchange column in 25 mM Tris pH 7.5. The 2S albumin does not bind and is then pure as judged by SDS-PAGE when stained by Coomassie brilliant blue (Poltronieri et al. 2002 ). The N-terminal sequence of the 2S albumin is VTXEEGXYSISDQSKVGE (Poltronieri et al. 2002 ). An internal sequence QXIRSPDREM was also reported. Note that the Swissprot entry makes these into one sequence. Poltronieri et al. (2002)  shows the Mr of the 2S albumin as 12 kDa but Sathe et al. (2001)  report approximately 16 kDa. Process, chemical, enzymatic:Venkatachalam et al. (2002)  show that binding to rabbit monoclonal antibodies and to human IgE partially survives roasting, blanching, autoclaving, and microwave heating. Binding to the 39 kDa to 66 kDa bands is more stable than to the lower Mr. bands. Allergen properties & biological function:Amandin is the major almond storage protein and is one of the legumin family of 11S seed storage globulins. Allergen purification:Defatted almond flour was extracted with 10 volumes of 0.02 M Tris-HCl (pH 8.1 buffer) with constant magnetic stirring, filtered through glass wool, and the filtrate was centrifuged. The supernatant was loaded onto a DEAE DE-53 column equilibrated in 0.02 M Tris-HCl buffer and then eluted with a 0-0.5 M NaCl gradient. Fractions containing the almond major protein, AMP, were pooled and concentrated. Aliquots were loaded on a Sephacryl S300 column in Tris buffer with 0.1 M NaCl. Fractions containing the AMP were pooled, dialyzed, and lyophilized (Acosta et al. 1999 ). Sathe et al. (2001)  present clear evidence for IgE binding to proteins in the 39-66 kDa range. Sathe et al. (2001) , Roux et al. (1999)  and Roux et al. (2001)  attribute this to the almond major protein, amandin. Poltronieri et al. (2002)  suggest that binding is due to conglutin gamma at 45 kDa. Roux et al. (2003)  note that >50% of patients with serious symptoms bind amandin and that the 66 kDa band corresponds to unprocessed amandin. 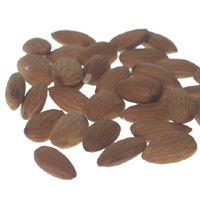 Prunin, described as the major storage protein of almond (Garcia-Mas et al., 1995 ), is taken above as a synonym of amandin. Acosta MR, Roux KH, Teuber SS, Sathe SK. Production and characterization of rabbit polyclonal antibodies to almond (Prunus dulcis L.) major storage protein. Venkatachalam M, Teuber SS, Roux KH, Sathe SK. Effects of roasting, blanching, autoclaving, and microwave heating on antigenicity of almond (Prunus dulcis L.) proteins. Garcia-Mas J, Messeguer R, Arus P, Puigdomenech P.
Molecular characterization of cDNAs corresponding to genes expressed during almond (Prunus amygdalus Batsch) seed development. Nature of main cross-reacting proteins:The almond 45 kDa allergen is a 7S cupin and the N-terminal sequence is closest to that of lupin. Allergen properties & biological function:The 7S proteins are seed storage proteins. Allergen purification:Almond extract was prepared by defatting with diethyl ether and washing with acetone at -20 degrees C. This was extracted with 10 mM potassium phosphate buffer pH 7.4 with 150 mM NaCl, 0.5 mM phenylmethylsulphonylfluoride and 2 mM beta-mercaptoehanol. After homogenisation and centrifugation, the supernatant was adjusted to pH5 and centrifuged. The supernatant was adjusted to pH 7.0 and solid ammonium suphate added to 40% saturation. The precipitate was centrifuged and resuspended in 25 mM Tris-HCl, pH 7.5, desalted on a Sephadex G-100 column and loaded on a Mono-Q ion-exchange column in 25 mM Tris pH 7.5. Gradients of 100-200, 200-300 and 300-500 mM NaCl eluted the 45 kDa allergen. SDS-PAGE separated one peak into proteins near 45 kDa and 27 kDa. The 45 kDa protein was N-terminaly sequenced (Poltronieri et al. 2002 ). The N-terminal sequence is TKSQTHVPIRPNKLVLKVQKDRATN (Poltronieri et al. 2002 ). Sathe et al. (2001)  present clear evidence for IgE binding to proteins in the 39-66 kDa range. They attribute this to the almond major protein, amaldin. Poltronieri et al. (2002)  suggest that binding is due to conglutin gamma at 45 kDa.